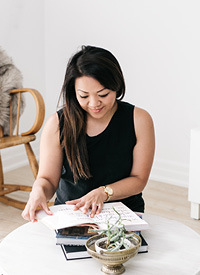 Sun, Sand and Swatches — Love On Sunday Love On Sunday | Interior Styling in Toronto and the GTA. On another note, I received some beautiful swatches from Tonic Living the other day and I'm in love with all of them. Swatches 2 and 4 are upholstery options for Louis. The first is a gunmetal velvet and other a pewter velvet. I'm really on this velvet tip, I don't know why. It's probably not the most practical choice for dining chairs but I know there's soil resistant treatments out there that I can use. The other 2 swatches I picked out are for outdoor pillows. I'm in LOVE with the navy and white fabric with ikat dots. Super cute! It's not really an outdoor fabric but I would only take them outside when needed. What say you? Thoughts on the velvet fabric and swatches?